Anyone would reasonably suppose that with the proliferation of ghost-and-paranormal shows on television (Ghost Adventures, Dead Files, etc.) the average citizen would be completely inured to stories chronicles of hauntings and proof of survival beyond the grave. However, the ghost story still has the power to petrify the reader of viewer, not only in the United States but around the world. Cemeteries – as a rule – are places to be shunned or at least given a wide berth, despite efforts aimed at making them places where people can go for a quiet afternoon of jogging or even meditation, or just to look at some unusual and imaginative headstones, if nothing else. The fear is nonetheless hard to dispel, and medical science avails itself of the term “coimetrophobia” to describe the overwhelming fear of final resting places. Buenos Aires’ La Chacarita Cemetery is among one of the largest in Argentina, and is, in fact, the country’s national cemetery. 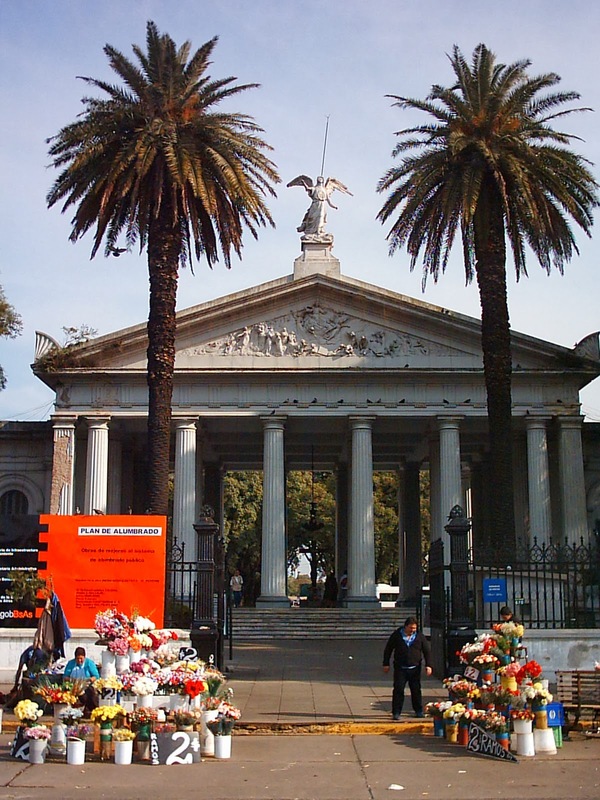 Renowned for its ornate mausoleums, La Chacarita preserves the remains of actors, writers and musicians and at least one president (Juan Carlos Onganía). The surrounding residential neighborhood that shares its name is also popular for its cafés and night life, but one resident stands out for its high strangeness – the Phantom Taxicab. Stories of this improbable vehicle were first set down in written form by Guillermo Barrantes and Victor Coviello in their Buenos Aires es leyenda (Buenos Aires Is Legend, ePub, 2004) series of books, involving a seemingly normal liveried vehicle seen in the streets and avenues surrounding the massive cemetery, on duty and ready to collect a fare. A young woman – says one story – had gone to the La Chacarita to pay her respects at her mother’s grave and flagged a taxi outside the gate to return home. Saddened by her visit, the young woman paid little attention to the vehicle she had boarded until an intense sensation of cold chilled her to the bone. Glancing at the windows, she saw they were closed and turned to ask the driver about the less-than-comfortable temperature. In a mixture of surprise and dismay, she noticed that driver had a deathly pallor to his features, looking like a corpse. Catching a glimpse of herself in the rear view mirror, she was shocked to find that her own face was that of a cadaver…at the speed of light, a flood of half-remembered rumors overwhelmed her brain. The driver would only take her back to the cemetery, as she herself was already dead. Logically, there is no way she could have told this story to anyone, being deceased, but it became one of the many stories surrounding the cemetery – another urban legend of a major metropolis. It may be that her narrative was confected to create a backstory of sorts to a real unexplained event: The death of a thirty-nine year old woman named Felipa Hospertatto, who was found lying on one of the graves early in the morning by another visitor. Forensic specialists had determined the likelihood that she had been there all night, “taken by a sudden heart attack, related to the loss of beloved relatives”. His joy turned to horror as he noticed the driver’s skeletal hands resting on steering wheel. Argentina’s El Tribuno newspaper recently published an article about a ghostly entity that has been striking fear in the hearts of residents of the city of Salta, which has enough to worry about with its long history of UFO sightings. Reporter Daniel Díaz looked into the curious situation, obtaining detailed descriptions of the bewildering entity: a tall, thin figure of a woman, walking upright, whose face is not fully visible, but whose eyes create an intense feeling of disquiet in those who approach her. The ghostly female presence has become known as “The Widow of Güemes Street”, at least to workers in a slaughterhouse by the cemetery. The Widow appears not be alone. A driver motoring along Güemes Street in the middle of the night was startled to see the outline of a gaucho (the cowboy figure of the Argentinean pampas) standing in the middle of the road. “He was over six feet tall, wearing an elegant outfit with a wide-brimmed hat, perhaps the widest I’ve ever seen. He gave me a sinister smile and didn’t move from the road. I had to dodge him by the wire fencing, and then floored the accelerator,” said the driver, adding that he spent the following minutes in fervent prayer after seeing the figure was no longer visible in his rear view mirror. Salta is hardly the only Argentinean city beset by ghosts. The Buenos Aires suburb of Ciudadela has its own story to tell, this one involving a regular city bus making its way down Alvear Avenue one night. As the bus approached one of the town cemeteries (the Cementerio Israelita, in this version of the anecdotal account), passengers saw a "white cloud" rise up from the cemetery and approach the vehicle. As the cloud approached, its female features and outline became clearly visible. It accompanied the bus for a brief period of time, floating in the air, disappearing the moment the bus left the vicinity of the cemetery. Six thousand miles away, jumping across the Equator and back into the Northern Hemisphere, we find ourselves in Madrid, where an art museum – El Museo Reina Sofía, inaugurated in 1986 – has become the protagonist in a phantasmagoric odyssey. The massive structure, remodeled in 2001 by French architect Jean Nouvel, dates back to the mid-16th century when King Phillip II (of Spanish Armada fame) decided it would be advisable to gather all of the hospitals, almshouses and other care-giving facilities in a single location, as the area, known as El olivar de Atocha (the Atocha olive grove) was already infamous as a place where the destitute were abandoned to die and left for subsequent burial. 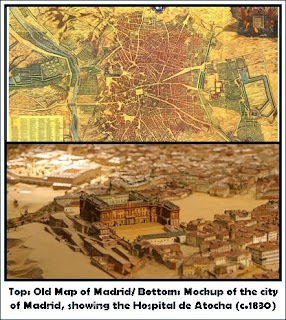 The task of building the giant hospital was left to Charles III and subsequent monarchs over the course of the next centuries, adding more buildings to the Hospital de Atocha yet never quite fulfilling the scope the original blueprint. At its peak, Atocha had a capacity of eighteen thousand patients. The building was abandoned in the 1960s and languished in darkness until the decision was reached to turn it into an art center in the early Eighties. Grisly aspects of the behemoth structure soon became known as workers found skeletons, chains and shackles, and even the mummified remains of three nuns in one of the chapels. Alvaro Gariño, writing in the April 1995 issue of Diario 16 (“Los fantasmas del Reina Sofía”) described the strange phenomena reported by the museum staff, ranging from doors opening and closing of their own volition, wailing and screaming in empty chambers and strange phenomena playing out in the hallways. It emerged that even during the years of service of the hospital, patients had complained of unexplained noises and apparitions. Even darker information came to light about the structure having housed hundreds of bodies during the Spanish Civil War, a place of torture and executions. These stories of the past offered no solace to current employees who witnessed processions of ghostly nuns through the courtyards, hearing only the sound of their heavy rosaries, or photographers who found extra, and unwanted, faces in their images of historic art, much less to the cleaning staff coming across ghosts seated on benches as they went about their morning duties. On a subsequent investigative journey, it was Navarrete, the psychic, who had the worst experience. “The most awful sensation was entering a circular chamber on the ground floor, where I saw several men shackled to the wall. I could see one trying to assail another, biting his face.” The article goes on to say that this museum chamber had once been the psychiatric ward of the old hospital. An array of entities from centuries past manifested during a Ouija session held by the Hepta Group members in the museum: Malú, a 16th century Jewish woman, said she had lived in the year 1594 and only wished to “give glory to God”; the prioress of a religious order which had operated in the ancient structure in the mid-1700 appeared next; and finally a self-confessed murderer named Ata, who had appeared in earlier spirit board sessions. Curiously enough, this entity had no idea when it had lived or under whose reign it was. He professed not being happy, but wanted no aid from the living, according to the feature in Diario 16. Among the more enlightened entities appearing during the session was a pulmonary specialist who had served during the Civil War years and died in the building. 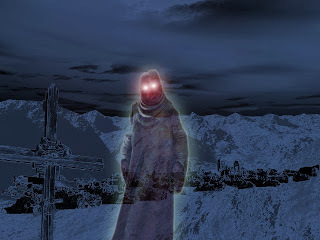 Researchers were advised that the building was filled with entities going as far back as 1585. The Hepta Group produced a final, nine page report known as "El Informe Ata" (Ata or “Ataulfo”, honoring the restless spirit contacted twice in the Ouija sessions) concluding that the paranormal events were the result "of the intense emotional burden inherited from the years when the structure housed a hospital." No further information on the hauntings was ever made public. It is to be assumed that they are still ongoing. Best Wishes for the Coming Year!